Published on June 30, 2013 July 16, 2013 by Proud Mama of Four! Where to begin!?! We started the month in the USA searching for hope. We left home, boarded a plane with three spirited children, and went to meet the world leading specialist in OMS. He was supposed to provide s Arita, insight and give us a plan to bring home which would rid us of this monster that has stolen our beautiful girl’s innocence. While in Springfield the kids enjoyed some sight seeing of the town of Lincoln, we visited a small local zoo and we enjoyed some amazing weather. Abbigail’s big procedure was a spinal tap to reveal which cells exactly are being taken over and turning against her immune system. This test also revealed the extent of the brain inflammation as well as some other hugely scientific markers used to determine Abbigails prognosis and to trailer a treatment plan for her. The doctor was amazing and so was his staff. 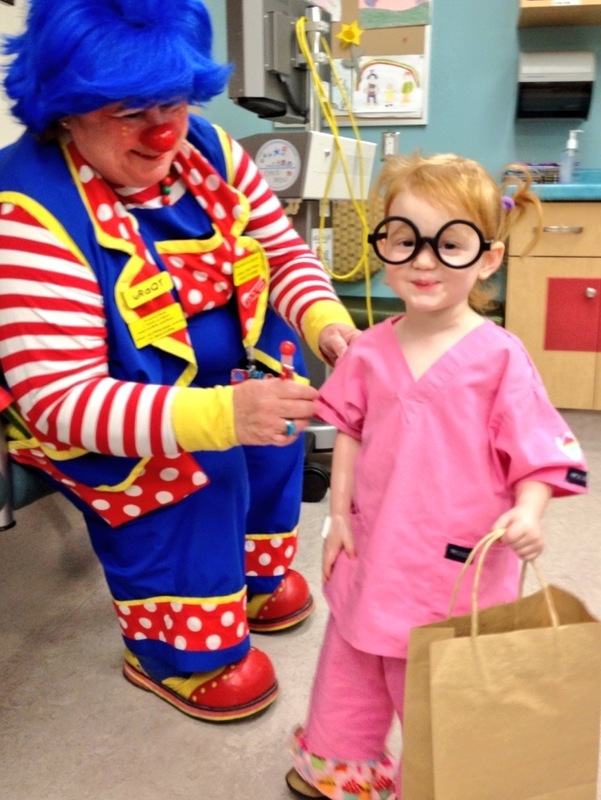 Abbigail enjoyed most of her visit and was the talk of the hospital in her super scrubs! After a week long stay, we went home an waited for news on the spinal tap. These results were our hope. They were supposed to give us answers and logic and help us save our daughter from the OMS terrors, suffering and pain. We waited all week after returning. In the meantime, Abbigail had an other routine MRI (every 3 months). We continually check her abdomen and pelvis to ensure her cancer doesn’t return. She has had a half dozen already and they always come back NED! Best three letters any cancer patient could receive! Just so everyone knows what NED means…..NED means no evidence of disease. It means there’s no test or scan sophisticated enough to “pick up” disease. A child can still have disease in the body, but it’s just not seen. So we did the scan on the Thursday after returning and the following day was her monthly antibody infusion treatment (IVIG). While I played with my precious baby girl and watched her giggle as she tickled her baby brother’s tummy, the oncologist walks in making our usual small talk to Abbigail. No doors shut this time, just a few words is all it took, much the same as those dreaded first days as a cancer mom. My heart began to race as I listened to her tell me they found a new growing mass in her liver. I want to know what this is and when can it be removed! Slow down I’m told. This mass required a biopsy. Without going into detail, a liver biopsy is dangerous and complicated and in Abbigails case, as most medical things seem to be with her, extra rare and difficult. They tried to get a biopsy last week, Abbigail endured more than you want to know, more than a parent can stomach, and the biopsy wasn’t successful. The urgency to discover what this still growing tumor is exactly, is increasing. We are off to camp trillium tomorrow and as we try to relax, we know the team of doctors, surgeons and radiologists are meeting to discus Abbigail’s case. Her lungs and kidney are obstructing access to the tumour making closed biopsy difficult and risk. There will be an other biopsy scheduled for next week, we will be called away from camp to bring Abbigail in for yet an other CHEO sleep over and days of torturous testing and more anaesthetic and sedation, needles and pain. This second attempt at a biopsy is being done because we still need to know if this is Neuroblastoma again and doing an open biopsy could be potentially life threatening. There are so many feelings being felt here this week, so much being said and even more not being said. Matthew and I are paralyzed in fear that our daughter is possibly facing a fate we know all too well now. We aren’t naive anymore, we can’t be told it will be ok. We know too much. And so we wait, the agonizing wait for answers. We are paralyzed and unable to move for we fear those words…this time the words are louder and much much more painful. Oh wait! Dr. Pranzatelli … He wanted to provide us with the hope we so desperately sought, but he was unable. Abbigail does have substantial brain swelling and our fears of OMS have been confirmed. The damage that was caused to her brain is permanent. She has suffered a number of relapses since diagnosis and he feels that they have each caused further permanent damage and that subsequent ones will continue to do so as well. So he laid out a plan for us to review. This plan however didn’t involve much in terms of changing what the OMS is doing to her. He wants to prevent relapses with oral chemotherapy at home weekly for a year. This will hopefully train her immune system to stop turning on the OMS and attacking her brain each time her immune system is activated (cold, virus, fever, extreme fatigue, sedation, etc). He feels that Abbigail may be as close now to being at a baseline, which means this may very well be as good as she gets meaning further treating her will do more harm than good. This kills me! She isn’t Abbigail! I don’t accept this and wont stop fighting! Next week is huge for Abbigail. We will know if she has relapsed and if the cancer has returned. If it has, we will put one foot in front of the other and keep on fighting like a kid! If we dodged a big one, we return to her OMS treatments as scheduled, as for now we must stop them until this tumour is dealt with. Damn it I was hoping for a lot better news than this. You must be so devastated, I can only imagine how frustrating this is. We will continue to pray for your little angel, the power of prayer is an amazing thing and hopefully we will get to see this power first hand and Abbigail will be alright. Wishing and hoping and praying for GOOD news because enough is enough!! We are thinking of you and and your sweet abbigail this week and you learn more about the future with abbigail. Treasure every moment, and we are never guaranteed another day on this earth.